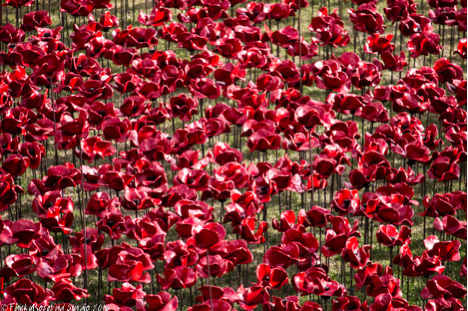 Yesterday we went to the Tower of London, not to see the Tower itself, but to see the installation commemorating the centenary of World War 1 'Blood Swept Lands and Seas of Red' Created by ceramic artist Paul Cummins, with setting by stage designer Tom Piper, 888,246 ceramic poppies will progressively fill the Tower's famous moat. By the end of November the moat will be full of poppies, one for each of the 888,246 British and Commonwealth forces who died. Every evening at sunset the last post will be sounded and a roll will be called of some of the fallen. You can nominate a friend or relative's name to be read out on a certain evening here. I very much hope to visit again in November when all the poppies are in place which will be a truly awesome sight both in terms of the visual impact and what it represents.